Nopal cactus have large paddles that grow at random angles. The paddles of some varieties grow as large as 16 inches long and 9 inches wide. The fruit that grows from the tip of each fresh paddle is called a prickly pear. Nopal cactus paddles and fruit are grown and harvested for culinary uses, though the sharp spines require careful preparation before cooking. Nopal cactus grow readily in hot dry climates, and as a house plant, this prickly desert dweller needs minimal care. Plant nopal cactus in full sun and sandy, well-draining soil. Cactus are drought-tolerant and have adapted to harsh dry conditions; avoid wet, heavy soils. Protect nopals from cold winter winds. Check the top of the soil once or twice a week. When the top 2 inches of soil are dry to the touch, add water until the soil is damp to a depth of 3 to 5 inches. Fertilize once a month. If you are growing nopal cactus to harvest the paddles, UC Davis Extension Service recommends a high-nitrogen fertilizer to increase production. To encourage flowers and fruit, fertilize monthly with a nitrogen-free fertilizer (0-10-10). 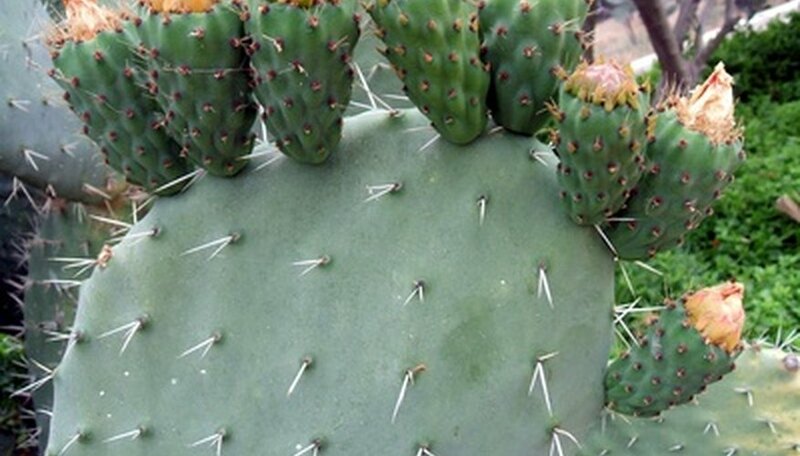 To harvest, shape or thin the nopal cactus; take a paddle and twist it from the plant. Wear gloves and watch out for the sharp spines. Plant potted nopal cactus in a mixture of equal parts peat moss, perlite and coarse sand. Use a pot that is twice as wide as the diameter of the cactus paddles; make sure the bottom of the pot has several drainage holes. Keep the cactus indoors when temperatures are below 65 degrees F; take it outside in the summer when the weather is warm and set it on a sunny porch or area of the garden. Fertilize once a month with a no-nitrogen fertilizer to encourage flowers. Nitrogen will increase the production of paddles and stimulate your cactus to quickly outgrow its pot. Add water whenever the first 2 inches of soil are dry. Twist off paddles to prune, shape and reduce the size of your house plant.